Thanks to Ahuva, I actually attended (most of) Philip’s talk today (via treet TV, I think, although I can’t find any record of it on the website). 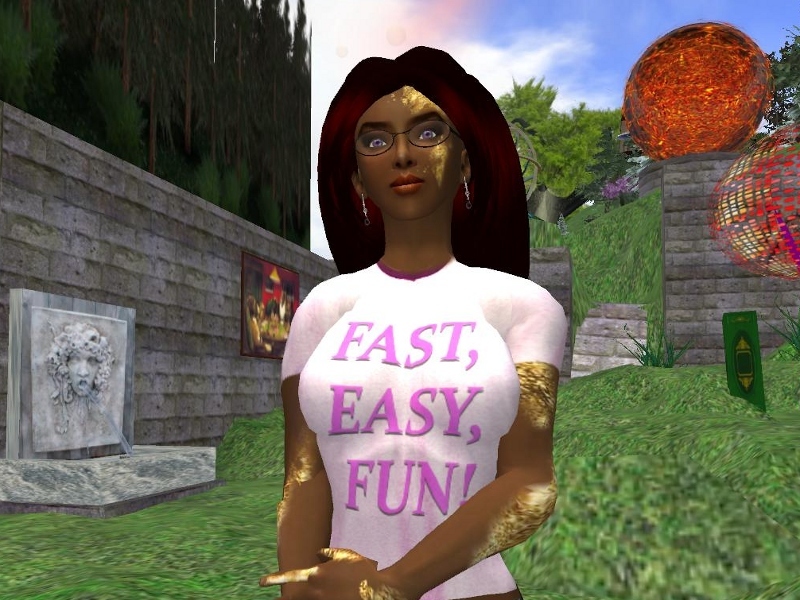 Mostly I attempted to cause amusing things to appear in the live Twitter scroll below and to the right of the video, while letting his soothing words wash subcognitively over me, but I did notice that he said that the new design goals for SL are “Fast, easy, fun!”. Which, as I immediately recognized, belongs on a tee shirt. Update: Impressively, it seems I was not the first. However, only mine is magenta! Okay, usually I avoid Lab-bashing, ’cause I know firsthand that what they are doing is real hard, and I adore the end-product. I’ve submitted two tickets lately, one about the lag in Vallone where my Zindra land is, and one about the tons of abandoned land in Hughes Rise. On the first, I eventually got a belated note saying that the region had been restarted since I submitted my ticket, but if it happened again I should feel free to contact Live Help for faster service. On the second, as far as I can tell no human has looked at it in the five weeks since I opened it. I mean, words fail, eh? It’s an absurdly small limit in the first place, and not telling the customer about it until after they’ve tried to give you more than 255 characters of information is just actively user-hostile. So I curse, reduce the size of my longest input to under 255 characters (thus making it less valuable to the Lab), and press Submit again. I curse louder. Maybe the total length of all the input fields on the page can’t be more than 255 characters? So I pare them down to the bare minimum, and press Submit again. Nope, apparently you get only one chance, and if you ever go over 255 characters, the page will just taunt you with the fact forever, and not let you submit. Just because I am such a nice guy, I close the browser window, go back to the original email, click the link, and fill out the whole form again, carefully keeping my responses short. 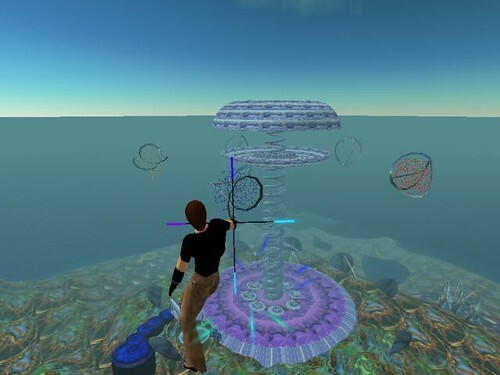 And I send off a peeved letter to support at secondlife dot com, and vent in my weblog. Brief self-plug (unlike all the other postings here hahahaha): having finally been sufficiently assured by various friends that the Thingmaker is a thing that could be sold, and that selling things on xlstreet slstreet xstreet SL is easy, and having in a burst of realization figured out how to set the perms so that the Thingmaker can be no-transfer but the Things that it Makes end up full-perm, I have put it up on there for the utterly random price of 175L. And three people I don’t know have already bought it! Selling stuff is really easy (although I hear xslstreetlsx is soon going to be replaced by some entirely different thing, so who knows). What else should I sell? If you’re reading this sufficiently close to (or distant from) the time I’m posting it, you’ll see that there’s a new header on the ol’ weblog here, involving two of my more common forms wearing some wild and rather npirl hairs, or hats, or headdresses, or something. I’m very fond of this banner, first because it fits so cleanly into the rest of the weblog design and I just like the image, and second and vaster because of the story behind those headgears. I posted the other week about an amazing outfit that I’d gotten at alpha.tribe, and about the alpha.tribe line itself and how refreshingly different it is from the run of the SL mill. I also linked to the alpha.tribe weblog. Well, I’m guessing that Alpha Auer followed the referer links back to here, and looked around and came upon various posts about the Thingmaker, ’cause I got a very nice communication wondering if a copy might be available. Being utterly flattered, I said sure and sent one along. Well! While I’ve never seen much of anything but sometimes-diverting abstract shapes in what the Thingmaker makes, the content creators at alpha.tribe apparently looked at the same things and saw… content! That’s me, in the alpha.tribe store, wearing a new alpha.tribe headpiece that uses a bunch of Thingmaker-arranged prims! How cool is that? Now ppl are encouraging me to sell Thingmakers on xstreet SL or whatever that thing is. And I might do that! If I can figure out how to get the permissions right. And if I don’t get distracted by something shiny!